PAPUA New Guinea is finding new petroleum resources. The Government agency driving all these is the Department of Petroleum and Energy. The National’s business editor SHIRLEY MAULUDU discussed with the department’s acting secretary, KEPSEY PUIYE, the developments taking place in the industry. MAULUDU: Tell us briefly what is happening in the petroleum and energy sector. PUIYE: The petroleum and energy sector is important to the national economy and the people. Traditionally, it contributes more than 35 per cent of foreign exchange earnings for the country. This is expected to increase to more than 50 per cent with the successful realisation of the world-class PNG LNG project and other new export-oriented gas projects such as the Papua LNG. It is critical that we manage this sector well, including the revenues it generates. I am also pleased to say that we are seeing unparalleled level of interest in upstream exploration, particularly offshore with water depths of 1500 to 3000 meters. For the first time in the history of our oil and gas business, investors are having great confidence in our offshore geological regions. Much of this confidence is driven by new data derived from a series of 2-D seismic surveys undertaken recently in our southern offshore region. I am confident that this new and increased level of confidence in upstream exploration, as expressed in serious investment dollars spent in exploration work, will certainly lead to unlocking PNG’s true hydrocarbon potential. In the meantime, much of the activities and the focus are in the petroleum or hydrocarbon sector, including LNG development. The energy sector, particularly the renewable energy sector, is relatively underdeveloped. It is a sleeping giant given the rich indigenous renewable energy sources we have. I would like to see this sector developed. For example, we need to promote and develop more mini hydro power plants and solar-driven power projects in remote and secluded areas where our people are not connected to the main PNG Power grid. I am confident this can be achieved under the National Electricity Roll-out Programme where the World Bank and other development partners are already demonstrating their support. I think the refined petroleum fuels market also needs to be managed and regulated properly and efficiently. The price charged at the retail market, or at the pump, must reflect true economic cost of business. Certainly there is an imbalance in this particular market and there is an immediate need to introduce new policies and support mechanisms which will promote a competitive market. MAULUDU: What is the Department of Petroleum and Energy’s role in the petroleum and energy sector? PUIYE: Its principal role in the petroleum and energy sector is to efficiently administer and regulate the sector. This entails granting licences and administering the entire petroleum licensing system. It is important to say from the outset that how the oil and gas business is administered and regulated is defined by the Oil and Gas Act (OGA). Therefore, the DPE’s main role is to enforce the provisions of the OGA. The department administers about 100 petroleum licences, entailing various types. As a principal regulator, DPE ensures that each licensee complies with all the conditions, including their approved work programmes. This is a very critical job in terms of enforcing compliance. We don’t want to see companies holding onto licences, especially prospecting licences, and not doing any quality work. Unfortunately, some licensees have been using these licences are commodities for trading in the market. One of the most critical roles DPE plays in supporting the oil and gas sector is promoting and marketing the industry. We engage on a daily basis with a lot of players – oil and gas companies, buyers, financiers, service companies and international colleague regulatory agencies. We try to provide the most accurate and factual data about investment in PNG and in its oil and gas sector. MAULUDU: I understand there are different licences issued for the development of resources in the petroleum and energy sector. What are the differences in those licences? PUIYE: It’s true that the DPE deals with a number of different types of licences. The importance of these licences and the process in dealing with them is defined under the Oil and Gas Act. The first type of licence we deal with is the Petroleum Prospecting Licence (PPL). A PPL is granted by the minister to undertake exploration in order to look for oil and gas. A PPL is initially granted for six years and can be renewed for another five years subject to the licence being in good standing. Petroleum Retention Licence (PRL): It is granted by the Minister in respect to a discovered gas field proven to be technically and commercially unfeasible. The Minister grants a PRL for the licence holder or licensee to undertake further appraisal work to determine the full geological structure and the reserves size. Petroleum Pipeline Licence (PL): A PL is a licence that deals with a specific pipeline that carries or transports oil or gas from the infield facility, such as a central processing or conditioning plant to an export terminal or to liquefaction plant. For example, the PNG LNG project was issued a number of pipeline licences which entailed the onshore route from Hides Gas conditioning plant in Hela to the Omati Landfall in Kikori, Gulf, and the marine segment of the pipeline between Kikori and Caution Bay outside Port Moresby. Petroleum Processing Facility Licence (PPFL): A PPFL is granted in respect of a main facility that serves as the receiving facility to filter the impurities, separate and condition the raw oil or gas before export. In the case of LNG, the liquefaction plant itself is operated under a PPFL. Petroleum Development Licence (PDL): A PDL is granted specifically to develop and commercialise an oil or gas project. It covers the development of all upstream facilities within the specified geological area or blocks which cover the petroleum pool or reservoir. The processes in granting these various types of licences are defined in the OGA. The Minister is the only legitimate authority which grants or rejects a licence, based on recommendation of the Petroleum Advisory Board. MAULUDU: What are the processes involved in the issuing of licences to investors who show potential to invest in the industry? PUIYE: PNG has a first-come first-serve arrangement under the present tax/royalty or concessional regime we have. That means an investor can apply for a new Petroleum Prospecting Licence at any time. It must meet three prerequisites. First, the applicant must demonstrate documentary evidence of a strong balance sheet or financial capacity. Second, it must confirm that it has a strong technical and management team. Third, the applicant must provide a clear work programme with a realistic budget to accomplish that programme. When an application is received by the Petroleum Registrar, it is registered and then sent to the DPE technical officers such as the petroleum geoscientists and the economists to provide technical and financial reviews and recommendations. The technical reviews are then submitted to the Petroleum Advisory Board through the chairman. The board deliberates on the application and often it makes a recommendation to the Minister based on the technical reviews made by the technical people. The minister makes the final decision. MAULUDU: What role does DPE have in dealing with landowner concerns and issues relating to the petroleum and energy sector? 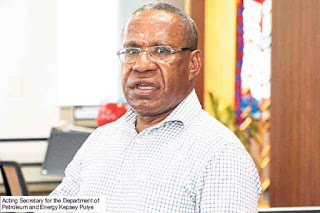 PUIYE: As the lead State agency responsible for regulating PNG’s oil and gas business, the DPE is also mandated to look after and address landowner concerns and benefits. DPE deals with affected landowners on a weekly or daily basis. Sometimes, it is difficult to reach an amicable solution to some of the most complex and contentious issues. But DPE always tries to find a balance so everyone wins. This process is already defined by the Oil and Gas Act. In respect to identification of legitimate landowners in a project, it is really the project proponent who is mandated to undertake full-scale Social Mapping and Landowner Identification Studies. This is a mandatory requirement that the Oil and Gas Act requires which the project developer is bound to fully comply with. DPE’s role in this particular activity is to basically vet the report. This is an area we did not get right in the PNG LNG Project. I will make sure proponents of each new project undertake full-scale SMLIS before we issue any licences for development. Our landowners are important partners in a project. MAULUDU: Does DPE have any plans or ideas to put forward to the new government? PUIYE: The message to the new Government is simple. PNG’s hydrocarbon industry is already big and is expanding and this calls for strong, robust and efficient regulation of the industry. DPE must be converted into an Authority as soon as possible so the industry to professionally and competently regulated. MAULUDU: What are some of the plans DPE has for the industry? PUIYE: I would like unequivocal support from the new Government to convert DPE into a Petroleum Resources Authority. DPE is already talking to relevant entities and individuals as to how best we should work collaboratively to build the capacity of the regulator and how best it should be institutionally set up. Quality and efficient regulation is key to elevating PNG’s profile as a favourable investment destination. This way, we are giving a very strong and positive signal to the industry that we do recogniwse the investment dollars companies spend in PNG. I firmly believe that when the regulator’s capacity is built and the industry is regulated efficiently, then PNG’s profile as a safe and reliable investment destination will be elevated and spiraled to greater heights. At the back of a very strong, efficient and robust regulator, I have plans to promote a wide range of policies and projects. For example; PNG needs to off-take low cost gas for power generation and other value-added industries like petrochemical projects and other projects a based on nature gas derivatives.